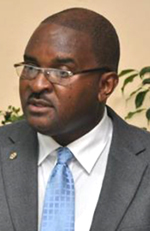 He has been on the Guyana Chamber of Commerce and Industry (GCCI)’s Executive for six years – serving for two years as Treasurer and Secretary, respectively, before being elected to function as Senior Vice President in 2012. And just this week he featured in local publications having been chosen this month as President of the Chamber. 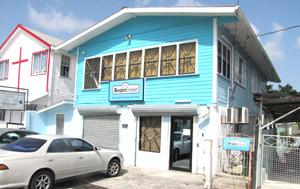 Our ‘Special Person’ is none other than Lance Hinds, the Founder and Chief Executive of the BrainStreet Group, a business information technology solutions company that offers a complete range of management information and business system consulting services for government and private sector agencies. His company also develops interactive content for the education and animation sectors. He has some twenty-plus years experience in the provision of professional services for the design, development and implementation of Information and Communication Technology (ICT) solutions for public and private sector agencies. And that is merely the tip of the iceberg. This consummate professional specialises in ICT strategic planning and implementation at the national level and also for rural community and hinterland development. His services have been commissioned by such organisations as the United States Agency for International Development (USAID), The Inter-American Development Bank (IDB), The World Bank, The European Union, The U.S. Departments of Commerce and Treasury. As is customary in these features, we give relatively brief background details about the early years or so-called formative period of our outstanding subjects, and for Lance Hinds, the journey began in England in 1962. He was born to Guyanese parents Charles and Ena Hinds. It was in 1969 that the family graced their homeland’s shores as part of a large number of Guyanese professionals who returned to contribute to Guyana’s development after it had attained independence three years earlier. Young Lance’s primary education experience was “shared” between Winfer Gardens, Fountain AME and New Comenius Preparatory, and was the ideal set of circumstances for someone who would later in life be exposed to interaction at a high level, as well as being sociable and more importantly, approachable. Headquarters of the BrainStreet Group in Queenstown. His secondary platform provided even more interesting alliances, when he took the Common Entrance in 1974 and gained a place at Queen’s College. One year later, he was transferred to The Bishops’ High, as part of the then Government’s coeducational initiative. So was it all work? In 1986, he received his BSc. in Computer Engineering from Howard University and two years later his Master’s Degree in Computer Science from the University of Maryland at College Park. He reflected that despite those academic achievements, and what would be considered the seemingly natural progression in terms of working environments, it was always his desire to essentially be on his own. “It seems as though I was destined to be an entrepreneur; I never worked in a structured office setting, even before graduation. I worked specifically as a Specialist Contractor for a variety of technology firms in the Washington DC area, so I was assigned to locations such as the US Department of Treasury, Naval Operations, Department of Commerce, and many others. 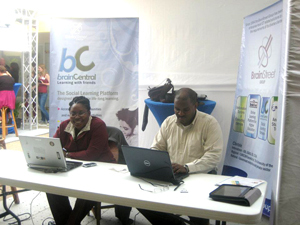 Participating in a Virtual Education trade show in Suriname. And so it is that his entrepreneurial proficiency and efficiency is well respected by his peers. The GCCI Presidency is testimony that he is held in high esteem. He briefly touched on the reasons for his affiliation with the prestigious entity. 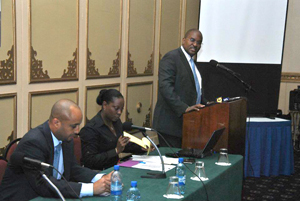 Among his other professional activities, Hinds is a member of the Caribbean Export Regional Innovation Advisory Group, which has been created to develop a policy framework and enabling environment within the CARIFORUM countries that will further foster entrepreneurship and innovation; and the Caribbean Export Private Sector Advisory Committee, which consists of a select number of experienced business leaders from around the Region who advise the Caribbean Export Development Agency on how to improve its existing programmes and also its overall strategic direction. He is a member of the CARICOM ICT Steering Committee (CISC), whose primary function is to develop policy and action plans for the implementation of regional initiatives to help governments and related stakeholders effectively use information technology to improve the general well being and productive capacity of its citizens. He is also a founding member of the Latin American & Caribbean Regional At-Large Organisation (LACRALO); a hemispheric ICT4D group that represents Latin American and Caribbean interests within the International Corporation of Assigned Names & Number (ICANN) framework as it pertains to the worldwide management and integrity of the internet space. And he is the current chairman of DevNet; an ICT NGO specializing in the development of solutions for the exposure and use of Information Technology in disadvantaged rural and hinterland areas. The aforementioned quality is something that stands out – caring for the underprivileged. Hinds is a Past President of the Rotary Club of Demerara, and is passionate about serving people in need, in whatever capacity he can. 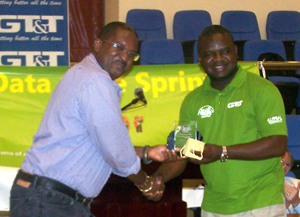 Receiving an award for 20 years of service to the ICT industry from UG’s Dept. of Computer Studies. Hinds is also a former President of the Malteenoes Sport Club; a former member of the Bishops’ High School Board of Governors; Past President of the Bishops’ High School Old Students Association and a past executive member of the Queen’s College Old Students Association. There is little doubt that the individual featured in this article is deserving of the recognition that comes with it.